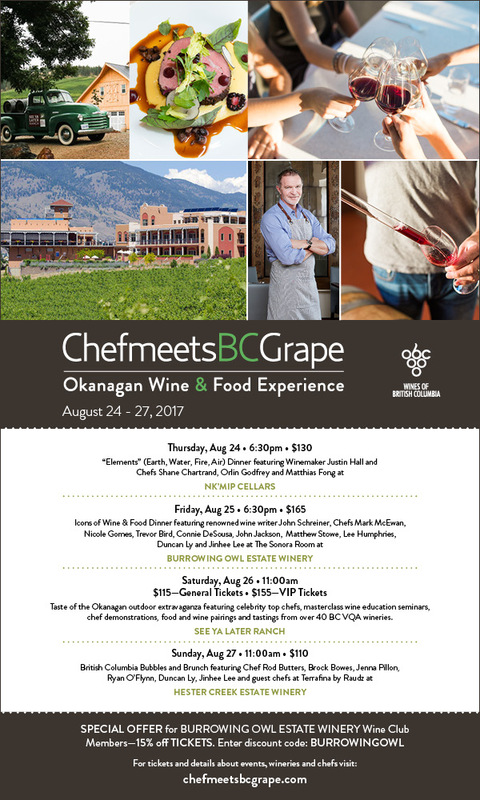 Taste and experience the best-of-the-best that Canadian cuisine and winemaking has to offer at the Icons of Wine & Food Dinner. 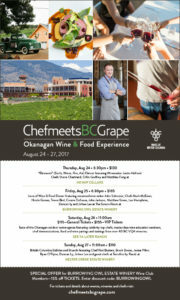 The Sonora Room Restaurant at the picturesque Burrowing Owl Estate Winery will host this incredible evening featuring iconic Chefs Mark McEwan, Connie DeSousa, John Jackson, Nicole Gomes, Trevor Bird, Matthew Stowe, Lee Humphries, Duncan Ly and Jinhee Lee as they come together for a top chef collaboration unlike any other. Canada’s most renowned wine writer John Schreiner will discuss his book Icon: Flagship Wines from British Columbia’s Best Wineries, and will be joined by emcee and Master of Wine Rhys Pender to lead guests through wine pairings of iconic BC wines. Please note – Burrowing Owl Estate Winery customers receive 15% off the ticket price by entering discount code: BURROWINGOWL. Enjoy!